What an exciting experience seeing one of the wonders of the world, Niagra Falls, and getting close and personal with them on the Maid of the Mist. Hardly a midst when you get close to the falls, more like a monsoon. 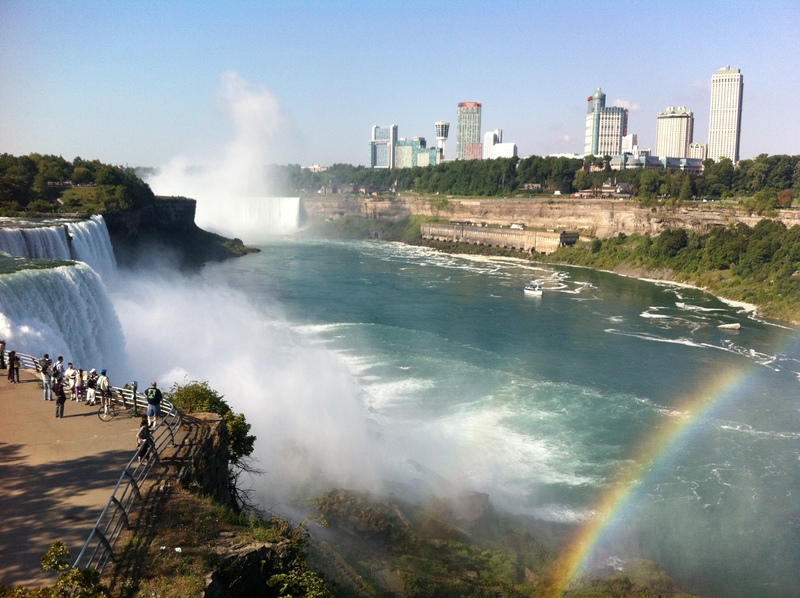 Note for next visit – go to the Canadian side for better views and access to go behind the falls. Then driving through Finger Lakes wine country. After a walk in Taughannock State Park, a Finger Lake park with Janet, our tour guide (while the younger crew on the tour swam in the lake), we move on to Ithaca. A hip, hippie college town at the bottom of one of the Finger Lakes. To my joy, I realize this is the place where the famous Moosewood restaurant is located. I have a couple of the Moosewood cookbooks, which I have a number of favourites that I’ve cooked a few times. Unfortunately the timing of our arrival and departure of this town meant that there was no chance to eat there. There was no disappointment in the location we went for dinner though. The Bandwagon Brew Pub, very hip with a great menu and a tasting of beers including a number they brew themselves. Great artwork for sale on their walls too (nearly took one home with me). This made for the start of a good night. A great bunch of people on this trip. So glad I experienced this with such a lovely group. They would be welcome to my home anytime.